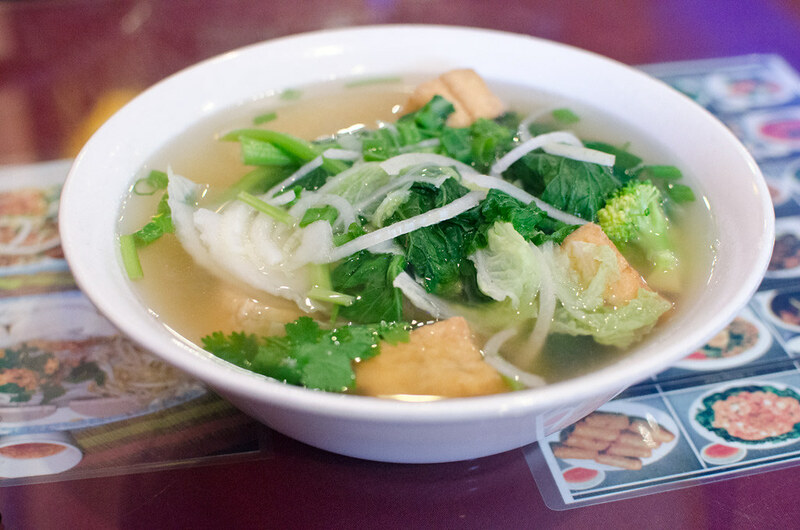 I’ve mentioned before that it’s hard to find good vegetarian pho here in Brooklyn. That’s one of the reasons I ended up making my own. At one place I went to in Sunset Park many years ago they advertised pho chay (“chay” indicating vegetarian) on the menu, but when I asked they said the broth was not vegetarian. The ended up bringing me a bowl of hot water with noodles and vegetables in it, and it was not so good. But sometimes on a cold winter day I find myself craving it, so I stopped by Pho Viet Nam on Avenue U to see if they could satisfy my cravings. When I asked about the broth they said they could give me a vegetarian one. What they brought was not a fully flavored pho broth (usually made with lots of spices and herbs) but was a huge step up from hot water. It tasted strongly of onions, and was mildly seasoned. After adding the provided bean sprouts and fresh lime juice I fortified it with chili sauce, soy sauce, and fermented bean paste, and it was pretty great. The noodles were thin with just a hint of chew, the fried tofu nice and firm, and the veggies were fresh and still crisp. I ate almost the entire bowl. I still like my vegan pho better, but Pho Viet Nam makes a pretty good one — just make sure to ask specifically for the vegetarian broth. This entry was posted in sheepshead bay and tagged pho, pho viet nam, sheepshead bay, vietnamese. Bookmark the permalink. The soup in that has fish in it. How do you know? I specifically asked for a vegetarian broth, and it certainly didn’t taste fishy.